Has An Iron Curtain Descended Upon Edmond Heatley’s Clayton County? Do Clayton County Teachers Feel Isolated, Disheartened, Disenfranchised, & Disemboweled? 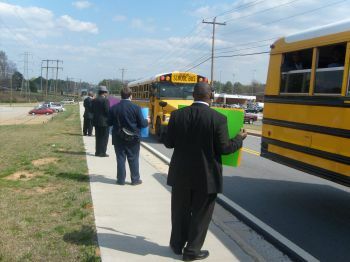 How Long Will The Clayton County Teachers Have To Suffer? How Long Will The Students And Parents Have To Suffer? When Will The People Finally Say, ‘Edmond Heatley, Enough Is Enough’? Next Election? | Georgia Teachers Speak Out! ← Is A Disparate Treatment Of Students Based On Race And Economics The Major Problem In Public Schools Today? Or, Is Just Lack Of Discipline The Major Problem? I Opine. You Decide. Has An Iron Curtain Descended Upon Edmond Heatley’s Clayton County? Do Clayton County Teachers Feel Isolated, Disheartened, Disenfranchised, & Disemboweled? How Long Will The Clayton County Teachers Have To Suffer? How Long Will The Students And Parents Have To Suffer? When Will The People Finally Say, ‘Edmond Heatley, Enough Is Enough’? Next Election? 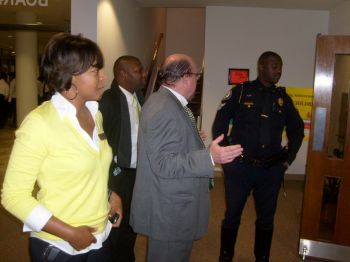 Dr. John Trotter had just finished engaging Edmond Heatley in a short conversation in the school board’s lobby about his administration’s failure to adhere to the Georgia Statute (O.C.G.A. 20-2-989.5 et seq.) concerning teacher grievances. Perhaps Dr. Trotter was letting him know that he was no longer residing in California but in Georgia where he was subject to Georgia Laws. He kept saying, “You need to talk with my attorney.” Does he have an attorney? I thought that Glenn Brock was the school board’s attorney. Is Glenn Brock giving Heatley proper advice in this area of the law? Hmm. The MACE Picketing Squad has had to picket some of Edmond Heatley‘s administrators to bring public attention to some matters of concern. This particular principal was transferred at the end of this particular school year. The school now has an outstanding principal. I have followed Clayton County School Board politics very closely and have been intimately involved with the goings-on of such for nearly 30 years. In my opinion, Edmond Heatley is the most despised superintendent to ever have come upon the scene in Clayton County. When Joe Hairston came to Clayton County in March of 1995, he became very disliked among the employees of the Clayton County School System. He was Clayton‘s first appointed superintendent, following a popularly elected superintendent, Dr. Bob Livingston. After a few years, Hairston was metaphorically rolled out on a gurney one evening, and he unexpectedly surprised the audience and county in general by his sudden resignation. This was in January of 2000. When Barbara Pulliam was hired in early 2004, it did not take her long to ruffle many feathers among the school folks. She, like most appointed superintendents, brought in her gaggle of administrators who appeared to be insensitive to others. Transfers of administrators were typically made. Some of “her administrators” from out-of-state were brought in to Clayton County and installed in key positions. Personally, I stayed out of much of the hoopla…because I knew if I acted too soon, I would be blamed for not giving her a chance to succeed. But, when the howling became so loud, I laced up the ole campaign boots, and we were able to take out two incumbents (Antonia Strong defeated LaToya Walker, and Norreese Haynes defeated Allen Johnson). (Representative Sandra Scott defeated incumbent Connie Kitchens, but I did not help Representative Scott. I did not know her at the time, but I did not help Connie Kitchens either!) So, the stage was set for Barbara Pulliam to have to face the music. She had been able to co-opt LaToya Walker (whom I had recruited and ran her 2002 campaign when she defeated incumbent Susan Wilson-Tucker). Allen Johnson, though he had been a teacher-friendly principal at Lake City Elementary School for years, had apparently fallen under Pulliam‘s spell. We felt that he had to go too. I have gone to about eight or 10 schools and have not been able to find out how to send an email to a teacher. It appears that the Edmond Heatley Administration has set up an iron curtain around the school system. Does the Edmond Heatley Administration not want parents to be able to communicate with their children’s teachers via email? Wow. Go to school systems all over the State of Georgia, and you will see that the schools’ website are parent-friendly with the teachers’ email addresses conspicuously displayed for the parents to see. Go to Bacon County Schools. Go to Washington County Schools. Go to Atlanta Public Schools. Go anywhere in the State of Georgia…except Clayton County. Why is Clayton County so backward…like North Korea? Will teachers soon be eating bark from the trees like the citizens in North Korea? I say this facetiously but to make a point that a closed system, a system walled off from the outside (even from parents), a system that is apparently paranoid, insecure, and control-freakish is not a healthy school system. It is a brittle school system which is about to break. The ability of our arteries to bend, stretch, and to have elasticity is what keeps our hearts healthy. It is the inability to bend and the resulting hardening of the arteries which causes the heart attacks. I think that the Clayton County School System needs a great influx of Vitamin C (open Communication with parents), Vitamin E (Encouragement & Empowerment for the teachers and staff), and a daily glass of Red Wine (to loosen up the arteries of the school system). Then, hopefully, the school system’s heart will recover from the massive Californian Heart Attack which occurred in the Spring of 2009 when the Clayton Board of Education hired this failed and highly inexperienced superintendent from Chino Valley, California. Who recommended him? Oh, yes, I believe that Edmond Heatley was another one of Glenn Brock‘s “finds” on the shopping cart at the Broad Foundation. (c) GTSO, June 18, 2011. 1 Response to Has An Iron Curtain Descended Upon Edmond Heatley’s Clayton County? Do Clayton County Teachers Feel Isolated, Disheartened, Disenfranchised, & Disemboweled? How Long Will The Clayton County Teachers Have To Suffer? How Long Will The Students And Parents Have To Suffer? When Will The People Finally Say, ‘Edmond Heatley, Enough Is Enough’? Next Election? so true about Clayton County. I tried to email teacher but could not> What are they afraid of?? ?